In 1844, philosopher Friedrich Engels wrote about poorly designed Victorian English cities that segregated the poor in the center of town, away from the wealthy, who lived in the country surrounding the urban area. Emory College of Arts & Sciences students in the course “The Architect and the City” recently discussed how the inverse seems to be happening now in Atlanta, where record intown growth is fueling a push of the working class to the suburbs. The point, says Christina Crawford, assistant professor of art history, is that cities do not naturally come to be but are the result of pointed decisions made by those in power. Her course reveals the ways architects in particular shaped cities starting in the 19th century, long before the concepts of urban design and sustainability arrived on the scene. In class discussions, students reveal how urban form is a product of its time and culture. 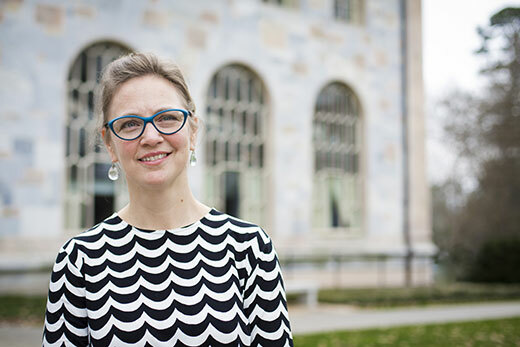 Crawford worked as a registered architect and urban designer, and also taught architectural history, before joining Emory in 2016. Her scholarship focuses on architectural and urban design strategies used in times of intensive transition, the very issue she wants students to notice as they look at cities. The best architecture strikes a pleasant balance between buildings and open space. The course discusses how that balance can be distorted, as happened when small urban centers expanded rapidly with the advent of industry. Students learn how architect Daniel Burnham’s famous attempt to tackle that haphazard growth — known as the 1909 Plan of Chicago, it called for features such as long axial streets and lush parks along the city’s lakefront — was itself warped by later architects. Isaac Daley, a senior with a double major in Spanish and art history, saw that distortion researching the British creation of a new colonial capital in New Delhi, India. It featured the same wide boulevards and gardens that Burnham used, but the elements were designed to symbolize power rather than serve residents’ needs. That has since prompted him to consider the urban issues facing St. Simons Island, the Georgia barrier island where he grew up and where he is involved with a community land trust that preserves land from tourism development. Crawford encourages students to view cities in new light in the class discussions. She has also learned new ways of seeing cities through her students, who represent several different majors and bring their own ways of thinking and expertise to urban topics. A natural science major, for instance, might understand urban structures as akin to a chemical model, instead of through transportation, she says. The key for senior Athira Penghat is viewing architecture as a functional art form. Penghat, who has a double major in anthropology and human biology and human health, plans on becoming a physician working in community health. Understanding public health in cities seemed practical. She was surprised, though, to see just how much urban planning can affect health. Comparing her native San Francisco to Atlanta, Penghat noted the shift from a compact, walkable community into one with a sprawling tangle of roadways. That specific urban planning decision has created more sedentary lives and the concept of food deserts. Crawford delights when students begin to question the practicality of some of the famous urban plans the class investigates. Burnham, for instance, did not consider schools, housing or even sanitation in his grand vision for Chicago.